Molecular laboratory to support taxonomy, population genetics, metabarcoding and environmental deoxyribonucleic acid (eDNA) studies. 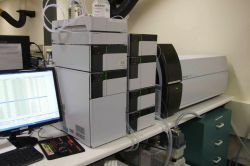 The environmental chemistry laboratory at Wodonga provides water and sediment quality analyses in support of both internal and external projects. Our services are also available to university researchers and the public upon discussions with our team. We offer tailored environmental and water assessment and monitoring solutions to meet your requirements. Shimadzu UV-2700 Spectophotometer:used for a range of colorimetric analyses. All of our analytical methods are based on standard industry Quality Assourance/Quality Control protocols and use externally calibrated standards and reference materials. The macroinvertebrate laboratory has processed aquatic invertebrate samples from across Australia for more than 30 years. We've built up an extensive voucher library that can be drawn on for species level taxonomic determination. The Centre for Freshwater Ecosystems (CFE formerly as Murray–Darling Freshwater Research Centre, MDFRC) developed and maintains the free online bug guide that is widely used for the identification of macroinvertebrates to genus and family levels. The macroinvertebrate laboratory is closely aligned with the Centre for Freshwater Ecosystems (CFE) deoxyribonucleic acid (DNA) laboratory, such that we can provide both classical and next generation approaches to biomonitoring. Macroinvertebrates are widely used as indicators in freshwater ecology due to their sensitivity to changes in water quality, community responses to changes in flows, food resources and climatic variability. They are useful for determining both structural (e.g. diversity, abundance) and functional (e.g. proportion of herbivores, carnivores and detritivores, trophic links in food webs) aspects of freshwater ecology and are relatively common and easy to sample. Our services are available to university researchers, stakeholders and the public and specific types of processing (e.g. taxonomic resolution, qualitative v quantitative) can be tailored to client needs. We have facilities and expertise to enable to identification of fish (larvae through to adults) and have developed a larval identification guide for Murray–Darling Basin freshwater fish species. Our staff also have extensive experience in zooplankton taxonomy and identification to genus and family levels. The Centre for Freshwater Ecosystems (CFE) has a strong background in the study of biogeochemical processes in aquatic systems including wetland acidification, blackwater events and nutrient cycling. Our expertise in these areas ranges from the molecular level understanding of biogeochemical processes to the development of water management strategies. We have equipment and facilities to study biogeochemical processes at a range of scales, from highly controlled laboratory reactors through to mesocosms and field studies. In doing this work we make full use of the analytical chemistry and molecular facilities of the Centre for Freshwater Ecosystems (CFE) as well as external research facilities such as the Australian Synchrotron. The ecotoxicology laboratory offers a wide variety of services, from determining the fate, transport and bioavailability of contaminants in aquatic ecosystems, to determining the ecotoxicological effects and thresholds on aquatic biota. access to the analytical and biogeochemistry laboratories for analysis of metals, pesticides, algal toxins, nutrients etc. The molecular biology laboratory at the Centre for Freshwater Ecosystems we use deoxyribonucleic acid (DNA) technology to answer complex ecological questions and provide invaluable knowledge for managing Australia’s freshwater ecosystems. The laboratory is supported by a dedicated team of staff and conducts research over a wide range of habitats and organisms. metabarcoding: identifying whole communities on mass from deoxyribonucleic acid (DNA) in samples such as sediment, biofilm or stomach contents. taxonomy and phylogenetics: understanding biodiversity and evolutionary lineages of organisms. The molecular biology laboratory works closely with the macroinvertebrate, microbiology and fish laboratories. the detection of whole communities or individuals from deoxyribonucleic acid (DNA) that is present in the environment. developing deoxyribonucleic acid (DNA) approaches to biological monitoring. exploring population structure in plants and animals. understanding who eats who from consumer diet studies using deoxyribonucleic acid (DNA) from stomach contents..
We offer a range of monitoring services using standard methods as well as the development of project specific sampling methods as required. Training and competency are an important component of Centre based activities and we strive to maintain a high standard for delivery of our monitoring and research activities.